Practical Motorhome reviews the Adria Coral Plus 690 SC, an island bed model with a chic interior – but does it have the substance to match its style? The range received a substantial update for this season, and the main changes included lower, narrower habitation bodies, which are 2.29m wide and 2.58m high at the front of the low-profile section. Despite this reduction, the internal area was boosted by half a cubic metre. Coral interiors are smart and modern, with clean lines. Because Adria exports 98% of its total production, its internal design has to appeal to as many buyers as possible. The styling of the Coral wouldn’t look out of place in a boutique hotel, with its clean cabinetwork and matching soft furnishings adorned by quality fixtures and fittings. The Adria Coral Plus 690 SC is a three-berth with a luxurious island bed in the rear and half-dinette in front. It will appeal to touring couples who want the flexibility for accommodating guests or occasional family members who join them on holiday. Adria has teamed a metallic-grey cab with a white habitation body, referencing the cab colour in grey side skirts that run between and beyond the wheel arches. Grey and silver stripes at waist height veer upwards to add a sense of motion, contrasting with two horizontal red bars. The lower habitation body makes the Coral Plus 690 SC look boxy, but the relatively low height of the overcab moulding offers improved aerodynamics, resulting in better fuel economy. The bodyshell is made from sandwich panels with polyester skins and, though the construction uses timber, Adria’s build technique is renowned for excellent structural integrity. The moulded rear panel is fitted with a pair of automotive-style light clusters. Inside, our test ’van offered the ‘Trend Horizon’ furniture finish, which has light oak veneers and brown worktops (a darker walnut finish called ‘Class Forest’ is also available). The floor covering was brown, halfway between the light cabinetwork and the dark-brown edges of the soft furnishings. All seats had biscuit-coloured infills that went well with the white walls, and decorative curtains picked up the colour cues in their horizontal striped design. It’s a contemporary look. The light tones make the ’van feel spacious. Several pleasing design points include a panoramic rooflight surround above the front dinette, a bulkhead with integrated strip light behind belted travelling seats, and mood lighting above the overhead lockers. It all lends an air of sophistication and makes this ’van a pleasant place to be. Although the 690 SC is right-hand drive, the habitation door is on the UK offside, so care must be taken when unloading passengers. This will be less of a problem for those who regularly tour on the Continent. The 690 SC rides on the Fiat Ducato with a 2.3-litre 130bhp engine that’s easily capable of powering the ’van, which weighs around 2800kg unladen. The six-speed gearbox helps find the right ratio to suit the road; our testers had no difficulty tackling long inclines. Front-wheel-drive means handling is precise, with no excessive body roll on corners, and power-assisted steering makes light work of manouevring at low speed. The ride is firm but comfortable, without excessive noise. The Ducato’s high cab seat position offers good visibility, although our test team found that the wide A-pillars impaired vision slightly on the approach to junctions. To accommodate the island bed, the 690 SC is quite long (7.38m), with a pronounced overhang. This will need to be considered whenever you’re using ferry ramps. In addition to the cab seats, three belted travel seats are available – two on the dinette seat bench, another on the offside – by converting the single sofa next to the habitation door. This is made up into a backwards-facing travel seat with the addition of a supplied headrest and the seatbelt stowed in the seat box. The seat is mounted on the dinette area’s raised floor, so a pull-out footrest is included for comfort. This motorhome is aimed at touring couples, but the 690 SC will happily seat five in its half-dinette, which can be made into L-shaped seating by deploying an extra seat under the nearside lounge window. Simply extend the hinged seat support from its stowed position flat against the seat box, insert the squab and backrest, and attach the latter using Velcro pads. With the two cab seats rotated and the adjustable table extended towards the offside single sofa, five seating positions are available for mealtimes – six if two people share the dinette bench. into the dinette from the nearside window and skylight, augmented by LED lighting in the skylight surround and mood lighting above the lockers. One major addition to 2014 Coral models is a multimedia wall on the left-hand side of the habitation door, which will please fans of digital technology. This has two tablet computer-sized recesses; the top one has USB and mini-jack audio connections. Viewing a tablet screen located here could be difficult from the dinette, but an optional flatscreen TV mount (£165), which drops down from the offside overhead locker, offers a much better alternative for watching TV. The Adria Coral Plus 690 SC has a compact, L-shaped kitchen sited on the nearside behind the dinette bulkhead. Cooks get a combination oven and grill, deep sink and tall fridge-freezer unit that will swallow lots of provisions. The galley layout makes good use of available space, with the cooker to the left and the sink to the right. Work surface is at a premium, though, only viable when the sink and cooker covers are in place. A drainer is included, and rests on the lowered kitchen cover. The hob has three gas rings, arranged in a line for optimum access, with substantial control buttons to the left-hand side. The largest ring is to the right. A splash guard is located to the cooker’s right, next to a small rail behind the sink, presumably for tea towels but without a great deal of drop space. The fridge-freezer is opposite on the offside. A cupboard above it would be the obvious place to house a microwave oven, but there’s no power point inside. It’s hard to beat the convenience of an island bed. It offers unimpeded access to the washroom for both occupants during the night and can be left set up all day. The Adria Coral Plus 690 SC’s island bed measures 1.95m x 1.46m, so it’s plenty big enough for a couple. It is accessed easily via steps on either side, but ascending each level reduces the overall headroom, which will affect taller people. An articulating headboard offers a comfortable reading position – simply push a handle under the foot of the bed, the frame slides into the rear wall and the headboard rises. Reading lights are set in the middle of the headboard, but Practical Motorhome's testers felt they’d have been better at each end. Mood lighting above the overhead lockers and side windows takes care of illumination. Windows on either side of the bedroom and a small rooflight let in plenty of natural light. The Truma Combi heater unit is located under the foot of the bed, but our testers didn’t find it too noisy. A substantial sliding bedroom door offers privacy from anyone sleeping in the third berth in the lounge. This makes up by dropping the dinette table’s telescopic leg and inserting cushions to form a 2.1m x 1.1/0.6m single bed across the motorhome’s width. The 690 SC’s washroom is split across the width of the ’van, with the shower compartment on the nearside, and the toilet and vanity unit opposite. The nearside shower has a semi-circular door that rotates to meet a bi-fold door. Two sides of the shower are lined with wallboard, with a moulded plastic unit behind where the showerhead attaches. The floor is also moulded plastic. There’s a small shelf for soap, and the intrusion of the nearside wheel arch makes a shelf for shampoos. The showerhead can be set high enough for tall people; a wooden board is provided for added comfort. A towel rail beneath the shower rooflight won practicality points from our test team. The toilet compartment is on the offside, sectioned off via a grey sliding tambour door. A basin sits below a window to the right of the swivelling cassette toilet. Above is a cupboard, ideal for lotions and potions, with a mirrored sliding door. Another cupboard is found under the rectangular basin, accessed via a positive catch. The counter to the left-hand side has a small shelf beneath. The Adria Coral Plus 690 SC’s layout offers a compartment under the foot of the bed and a voluminous rear garage. This is rubber-lined and heated, with hooks for tying down leisure gear, and it’s spacious enough to take cycles. Underbed storage can be accessed in two ways. The bed lifts out of the way on gas struts and can be secured with a supplied pole, or you can access the compartment from the front via a pair of cupboard doors. The bedroom’s double floor has one storage cavity between the shower and vanity areas and one on the nearside, in a compartment that houses the heater’s boiler dump valve. There are three overhead lockers in the lounge, two in the kitchen and three in the bedroom. Two wardrobes flank the bed. More kitchen storage comes via three soft-closing drawers (cutlery at the top, a deeper one at the bottom), plus a small cupboard under the oven-grill. A large drawer under the fridge is ideal for pots and pans. Two cubbies flank the lounge skylight – useful for items you need quick access to – and there’s a shelf above the habitation door. 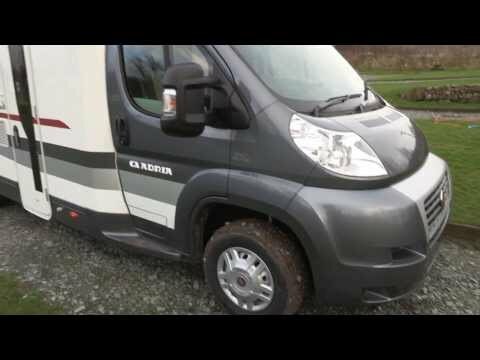 This motorhome is the Adria Coral Plus 690 SC. Adria’s Plus trim level sits between the entry level Axess and the top-end Supreme. Plus gives you flush-fit habitation windows instead of caravan windows, and a choice of ‘Trend Horizon’ or ‘Class Forest’ furniture finishes. A Driver’s Pack of cab-centric upgrades and an Inclusive Pack of habitation extras are also available. The latter includes the lounge skylight, reversing sensors, a slatted frame and sprung mattress for the fixed bed, a multimedia wall and a Truma Combi 6kW boiler. The Adria Coral Plus 690 SC feels like a lot of motorhome for the money. Adria is a renowned manufacturer with a track record of genuine innovation. Its ’vans appeal to a wide range of buyers. Updates to the Coral for the 2014 season made an appealing proposition even more attractive – we welcome the arrival of the multimedia wall, and the provision of five belted travel seats will appeal to motorcaravanners keen to take children on tour. To be picky, there’s a trade-off between bedroom and living-area space, and UK buyers will miss a separate oven and grill and microwave in the kitchen. However, in every other area, at the end of the Practical Motorhome Adria Coral Plus 690 SC review, we feel that this motorhome will give owners many years of happy touring.